Things don't often turn out how you'd expect, but today - the first of British Summer Time - started in a blaze of warm sunshine and stayed bright and clement throughout. Having missed yesterday's steamer due to pretty filthy conditions, it was pleasant to be able to wander out to the station in the early evening sunshine to catch one of the final First Great Western HST stock moves - in this case Midland Main Line coaching stock set LA79 finally returning northwards after sterling service covering for FGW stock under refurbishment. Interesting to see 47828 remaining, for now, in the surely soon to disappear Cotswold Rail livery. There is of course every possibility that LA79 will return to the area, as Crosscountry's summer additional services commence in May, and eventually when their refurbished HST sets begin working the South West to North East corridor. For now though, content to get my first hazy shot of the year at my local station - which must mean summer isn't far away. This month has seen me out and about far more than for a very long time, and along with other happenings here, I'm feeling much happier and more positive due to my regular trips. I hadn't planned to be out today, but a check mid-week remarkably saw cheap tickets still available for Easter services. Took the opportunity to follow up on a gensheet posting about diversions via Middlewich and headed for the north west. So, after a freezing early start, settled into fully reliveried 220001 for the journey to Birmingham, noting FGW's reformed 158950 on it's first day in service at Bristol. After that, a quiet, rather sleepy journey up to New Street. Changed at Birmingham for a Liverpool service operated by one of London Midland's Class 350. Bit of a livery cavalcade today, with a variety of versions of their green in evidence at New Street. Another quiet and quick run up to Crewe in cold but bright weather. On arrival, greeted by 67003 manoeuvring in the station. Otherwise a very quiet, very cold and windy morning. Had well over an hour to kill with very little happening except for a parade of Pendolino's, not going all the way today due to the much-publicised weekend of WCML closures. Finally the quiet was broken by 60076 appearing from Basford Hall with a ballast train. Wandered off to find my next service. In fact, finding the 12:26 to Llandudno was far from easy. The departure boards failed to mention the train at all, and an enquiry with Virgin staff met with an equally blank response. I showed my reservation, at which the staff-member's eye's brightened: "Ah, yes - you need to catch a bus for Chester. Over there on the Horse Landing". I wandered off in despair and semi-concerned my journey had been wasted. Having checked the journey planner before leaving I noted that the service was due to leave platform 1 so I made my way over. Soon enough, a Voyager appeared from the Derby line and the screens advertised the service, although it still failed to show on the departure boards. Once onboard, noted I was the only passenger in First aside from a railwayman learning the road. After checking I knew it would take nearly an hour to Chester, the Train Manager kindly fetched tea and biscuits, and we were soon off! Took the branch at Sandbach onto what appeared to be freshly maintained track. Middlewich was, I recall, once a fairly common diversionary route - but the controversial and botched resignalling here has left it out of use for some years. Once past the Hays Chemicals plant, little to see until the salt works with it's strangely lunar landscape. A flurry of snow as we passed Middlewich loop, the site of the station and a fairly sizeable settlement. After a slow crawl onwards, we reached Northwich South Junction, with the chord leading out to the station in very poor repair. We took the curve towards Mouldsworth and were soon making somewhat faster progress towards Mickle Trafford Junction and then Chester. Greeted by 67029 at Chester, for the first time in it's history in a photographable position as far as I'm concerned! Decent light due to a break in the clouds, so got some shots before wandering out of the station. Soon got cold and returned for coffee and a sandwich before heading for the Holyhead-Cardiff service I was planning to catch home. Very busy on arrival with passengers from the ferry, we left a few minutes down due to the unloading time. Via Wrexham and onto the Marches at Shrewsbury. A little south of here the steel-grey clouds closed in and we found ourselves heading into a blizzard. Quite stunning views of the hills capped with snow as we passed. Arrived at Newport on time, to find that once again FGW had cancelled my train onwards. Resigned myself to an hour's cold wait. Glad to have finally achieved this unusual diversionary route though. For the second week in succession I woke in London, contemplating an early start and a day of travel by unusual routes. Firstly, to Kings Cross - which this time around was definitely where we were starting out. 90028 had hauled the stock into the platform, and I made some half-hearted attempts at a picture which turned out very poorly. Interpreted this as a need for coffee. Wandered to the business end of the rake of Riviera Mk 1s to find 92022 positioned to haul the first leg of the tour to Doncaster Royal Mail Terminal. Prompt departure and some very reasonable running made for a good start, making pick-ups at a few rather damp and dreary looking suburban locations along the way. Interesting chat with the gent opposite too, who was a bus driver by trade and had operated both school services and rail replacement runs in this area and knew it very well. Always good to have a bit of an insight into the area. The real track-bashing soon began, and 'Quails' at the ready much of the carriage began to check our routes for the day and discuss the possible options. Despite the bashing which the BLS receives in some quarters, we have some knowledgeable and interesting members who aren't just a bunch of dribbling vestibule-huggers as some would paint us. Some disappointment that 56303 turned up rather than 301 which has yet to work a railtour. Still good to have a 'Grid' on the train though, and we made steady progress. First new track of the day was the direct route bypassing York station via the yard. Nothing of much significance stored there now, aside from wagons and enormous amounts of on track plant. We pushed on northwards, finding a little more new track at Longlands Junction where we avoided Northallerton, before heading to Norton South where we turned north again, heading back towards the East Coast Mainline at Tursdale Junction. It's possible to cover this track on rare PSUL workings, but not the trains are all rather inconvenient for a visitor from down south, so this too was welcome track. What was meant to be a cruise through Newcastle became a rather protracted stop, and we set off for Morpeth a little late. Joining the Blyth and Tyne route at Hepscott Junction. This was, for me one of the highlights of the tour, and naturally I managed to become very sleepy just as we started our rather slow run along the line! Soon found ourselves passing through the crossing at the tour's namesake, Choppington - luckily a photographer has immortalised the moment here. We lost further minutes as we headed south, eventually coming alongside the Metro tracks and turning again towards Newcastle where we were due to break and change locomotive once again. 66423 had been spotted at York earlier, and at Newcastle when we passed through, and remained at the back of the station apparently heading north. We expected a brief break due to lateness, but there appeared to be some confusion about the loco change, and the actions of an overzealous platform attendant caused a fair bit of havoc at the front of the train. Eventually, 66423 moved off and headed for the front of our train. We'd been expecting a Freightliner locomotive, and it appeared that this DRS example was in fact on hire. No complaints from me, and we settled in for a mainline run down to York, unfortunately not going via the King Edward Bridge following the recent derailment and imposition of a weight limit. Another loco change at York, and a much longer break meant time to wander a bit, grab something to eat and make a couple of phonecalls before heading to the front of the train to record the locomotive. There seemed to be some disappointment with 60048, but I've experienced a few on tours and they've been steady performers for me. With the light fading, we were soon back on board and heading for Doncaster RMT once again where we were due to change loco for the final time. Routed via Church Fenton and the mess of lines at Ferrybridge, there was a quite interesting discussion about possible lines and routes. Personally a little disappointed we didn't take the route via Milford as originally planned, but it was interesting to pass by Ferrybridge depot despite being able to see very little in the gloom. It was hoped that we'd have a different Class 92 for the return, but few thought it likely that another would be available. 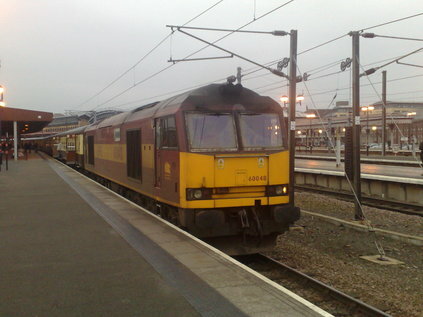 Passed by the station, noting 86101 stabled alongside. Also noted 92029 on a rake of flats. Quite a delay while we awaited the loco change, and then rather unexpectedly 92029 sped past to join the front of our train. I'd had a previous run with this loco in December, but it was still good to see a fresh engine as promised. Soon away, carrying a little delay, and achieving a steady 87 mph on the mainline. Despite some slow running further south and a brake problem at Carlton-on-Trent, we arrived back at Kings Cross only eight minutes after time. A really enjoyable and sociable day: lots of locos, a fair bit of new track and high mileage. I wondered if ending up on two tours on consecutive weeks was a good idea, but I've ended up having two enjoyable trips which have taken my mind off the stranger things going on just now. This should have been a nice easy day - roll out of my reasonably priced hotel and into Kings Cross for a not-so-stupid o'clock start. However, it became apparent as the letters from Pathfinder rolled in during the past couple of weeks that things would not be quite as straightforward. Credit to the team, and to Network Rail though - as despite all of the problems, possessions and restrictions, this train was scheduled to run and to cover pretty much all of the track that it set out to. So, instead of my easy start, left the clean but claustrophobic hotel, grabbed breakfast at Kings Cross and descended onto the tube for the trundle round to Cannon Street. All went fairly well, aside from a sudden realisation that Cannon Street LT station didn't open until 0730 on a Saturday. Had the presence of mind to make the leap at Monument and take the short walk to the station, passing London Stone on the way, which seemed a fitting opening to a day spent bashing the lesser known routes around the city. 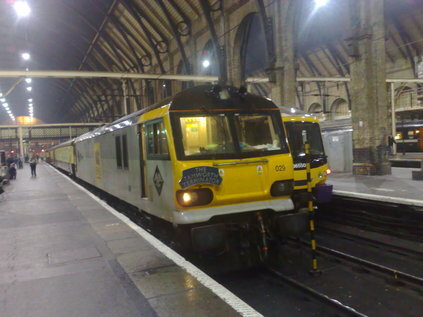 Nevertheless, a locomotive hauled departure from Cannon Street was a rare treat. Immediately onto new track, covering the curve west to Charing Cross - for many years something I've wanted to do, despite being a relative small section of line. After a pointless delay at Charing Cross (and a dire warning about flash photograph which caused a few giggles in Coach E!) we were off once again - heading for the dizzy heights of Tulse Hill. This was the first of three or four visits to this seemingly mundane location at the junction of four lines. This time is was a means of achieving our reversing point at Herne Hill, allowing us to achieve traversal of the ultra-rare Leigham Curve. This done, we set off once again into the tangle of lines south of the Thames. The lack of much development of the underground network here means there are a mess of commuter routes, with innumerable curves and links which see use either only at peak times, or as diversionary routes.. Took a huge westward loop here, travelling via the now very familiar Kensington Olympia and Acton Wells area to reach the Hounslow loop at Kew and then the less-travelled chord at Whitton. A fair bit of new track covered already, I'll confess I didn't find the idea of a lengthy run out to Uckfield of much interest - I'd done it on a Thumper some years back, and find the area rather dull - but the confusion of possible routes and lines, at least as far as East Croydon, kept our bay of seats interested with much discussion of former routes and lines in the area too. As predicted, the Uckfield and East Grinstead portions of the journey were rather less interesting for me. For some reason we were also booked to return to East Croydon to reverse between the two branches, adding more time to a wet, dull and misty trip. An opportunity to attempt to spot all of the elusive Southern 171/8 class however, and potential for photographs of both of our locomotives at East Grinstead. Soon back onto the mainline, and via an unexpected chord into Crystal Palace and once again Tulse Hill. Noted some works associated with the East London Line extension and the Overground project as we neared New Cross. Our destination was London Bridge, arriving in the terminal platforms - once one of our potential start points and now a chance for a break, a bite to eat and a wander around a station I don't often visit. Made a couple of calls home, and enjoyed a much needed leg stretch. Soon off again, this time to Victoria via some of the more unusual parts of the 'Battersea Tangle'. This involved a close pass of the once proud Stewart's Lane shed. Nothing of note to see nowadays aside from an apparently abandoned shunter and a very empty shed. Arrival at Victoria was in the 'VSOE' platform 8 alongside the wall which divides the two distinct sections of the station in a way much more obvious than it seems from the platforms. On departure we headed East once again and into the suburbs of North Kent at Blackheath. This allowed a long run, unfortunately most of it behind local units of which there are many on this route. Took the curve at Slade Green and doubled back to Blackheath via the tunnel. Next brief overlay was a pathing stop in the passenger loop at London Bridge. However, at the last minute we were switched to wait in the platform. You can win 'em all, and it must have been very incovnenient to have us stranding there for many minutes. Finally off and into Blackfriars. Following departure via Canterbury Road Junction (and another much needed bit of line) came perhaps the longest stretch of uninterrupted running all day. Setting out again via Kensington Olympia we travelled via the High Level station at Willesden and took the northern fork at Gospel Oak to head for Tottenham. From here, now sadly in the dark, we travelled via Temple Mills and passed the vast new Eurostar servicing facilities and more rather mysterious earthworks which deserve further investigation. We then wound our way back onto the North London Line travelling via Hackney Central and the curve at Canonbury to join the Great Northern lines as they rose from their tunnels at Drayton Park. A sensible and speedy run along the East Coast Mainline to Bounds Green where ECS sets were queuing for access to the depot, including one of Grand Central's recently completed HST sets. Took the flyover onto the Hertford Loop and again made swift progress to our final reversing point: the elusive bay platform at Gordon Hill. A real sense of mission accomplished among those stretching their legs on the platform in the rather damp and dark evening. Soon back on board, and onto the goods lines as far as Finsbury Park when further progress along these was prevented by more sets awaiting access to the depot. As we waited to cross onto the Up Slow two hauled trains full of Chelsea supporters flashed by on their way back from giant-killing defeat at Barnsley. We arrived, just a little after time in the suburban platforms at Kings Cross, where we should have set out from about fourteen hours ago. A short walk back to the hotel, with much Baker and Quail marking to look forward too. A well-organised, timely and interesting tour which like all London perambulations throws new light on old places.